Drought occurs regularly in the Lake Tahoe basin; however, the 2012 -2015 drought was one of the most severe on record for low snowpacks and high temperature. The multi-faceted effects of the recent drought on natural resources have yet to be quantified, which reduces the ability to adapt preservation and restoration management actions to future droughts. NAES scientists are synthesizing existing monitoring observations and remote sensing datasets from various sources in order to 1) quantify variability in drought sensitivity of streamflow, forest health, and water quality and habitat across the basin and 2) identify the factors that increase drought sensitivity. The expected outcomes from this project will aid natural resource managers by helping to focus management actions on the most at risk areas and resources during ongoing and future drought. The 2012-2015 drought was one of the worst on record for low precipitation [Swain et al., 2014], warm temperature [AghaKouchak et al., 2014], and poor snowpacks [Belmecheri et al., 2016] in the Lake Tahoe basin (Figure 1). Droughts in the region are expected to increase in severity and duration as a consequence of climate change [AghaKouchak et al., 2014]. Moreover, evidence suggests that pre-settlement droughts in the medieval period were longer in duration [Hatchett et al., 2015]. 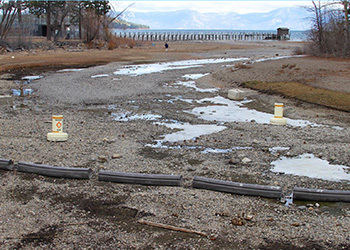 Together this information stresses the need for continued drought preparedness for Lake Tahoe. Droughts affect a large swath of key natural resources, including snowpack, streamflow and water resources, stream temperature and aquatic habitat, nutrient loading, forest health and dieoff, and forest fire risk. A major challenge for resource managers is pinpointing the negative effects of drought so that natural resources can be effectively co-managed at scales from forest plots to small watersheds. Identifying drought-sensitive areas will help focus the limited preservation and restoration efforts in the most critical areas. As an example, sites with more permeable geology and deeper soil depths (i.e. high subsurface storage) may show long declines in summer streamflow during drought, whereas sites with little subsurface storage may have relatively little change in summer streamflow [Safeeq et al., 2014]. Similarly, forest stands on low storage areas and earlier disappearing snowpacks are likely to be more water stressed and have lower fuel moisture, which predisposes those areas to tree dieoff and forest fires [Westerling et al., 2006; Hart et al., 2014]. Identifying the co-variation in climate, subsurface properties, and ecological adaptability is a critical scientific challenge that has not been undertaken in the Lake Tahoe basin. What physiographic and human impacts are related to increased drought sensitivity? Compile monitoring data from a wide-variety of sources into a database that can be easily queried and analyzed. Analyze ecohydrological monitoring data to quantify the severity of drought response and relate drought sensitivity to landscape variation of key natural resource areas. Synthesize results in articles, reports, and presentations that effectively communicate the degree and location of drought sensitive natural resource to managers and the public. AghaKouchak, A., L. Cheng, O. Mazdiyasni, and A. Farahmand (2014), Global warming and changes in risk of concurrent climate extremes: Insights from the 2014 California drought, GRL, 41(24), 8847–8852. Belmecheri, S., F. Babst, E. R. Wahl, and D. W. Stahle (2016), Multi-century evaluation of Sierra Nevada snowpack, Nature Climate Change. Breiman, L. (2001), Random Forests, Machine Learning, 45(1), 5–32. Coats, R., M. Costa-Cabral, J. Riverson, J. Reuter, G. Sahoo, G. Schladow, and B. Wolfe (2013), Projected 21st century trends in hydroclimatology of the Tahoe basin, Climatic Change, 116(1), 51–69. Hart, S. J., T. T. Veblen, K. S. Eisenhart, D. Jarvis, and D. Kulakowski (2014), Drought induces spruce beetle (Dendroctonus rufipennis) outbreaks across northwestern Colorado, Ecology, 95(4), 930–939. Hatchett, B. J., D. P. Boyle, and A. E. Putnam (2015), Placing the 2012–2015 California‐Nevada drought into a paleoclimatic context: Insights from Walker Lake, California‐Nevada, USA, Geophysical Research Letters. Safeeq, M., G. E. Grant, and S. L. Lewis (2014), A geohydrologic framework for characterizing summer streamflow sensitivity to climate warming in the Pacific Northwest, USA, HESS, 11(3), 3315–3357. Swain, D. L., M. Tsiang, M. Haugen, and D. Singh (2014), The extraordinary California drought of 2013/2014: Character, context, and the role of climate change, BAMS. Van Gunst, K. J., P. J. Weisberg, J. Yang, and Y. Fan (2016), Do denser forests have greater risk of tree mortality: A remote sensing analysis of density-dependent forest mortality, Forest Ecology and Management, 359, 19–32. Westerling, A. L., H. G. Hidalgo, D. R. Cayan, and T. W. Swetnam (2006), Warming and Earlier Spring Increase Western U.S. Forest Wildfire Activity, Science, 313(5789), 940–943.